When most Americans think of Chinese food, stir-fried dishes come to mind; however, this is hardly representative of the entire range of culinary expression in China. While stir-frying is a good example of the ingenuity of the Chinese kitchen in dealing with the necessity of conserving fuel, and turning that necessity into culinary genius, stir-fried dishes are only a small part of the full expression of Chinese cookery. 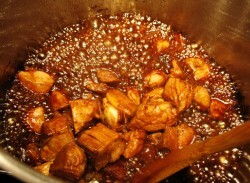 There are many other techniques employed in the Chinese kitchen, as well as cooking styles that use techniques much more familiar to the Western kitchen, such as braising, stewing, roasting and simmering. One such cooking style is called, “red-cooking.” Red cooking is the practice of braising or stewing meats and vegetables in a sauce which includes dark soy sauce, rice wine or sherry, star anise and other spices, and rock sugar to create a hearty deep reddish-brown sauced dish which is commonly eaten in the wintertime. Regional variations on the technique abound; in Sichuan province, for example, red-cooked dishes are given further color and flavor by the addition of chile-bean paste, a mixture of fermented soy and broad beans, chile and spices. Red Cooked Beef With Turnips is a perfect example of a typical Sichuan variation on the red-cooking technique. A more typical Cantonese preparation is one that uses fewer flavoring ingredients in order to subtly enhance the natural flavors of the meats and vegetables cooked in the sauce. 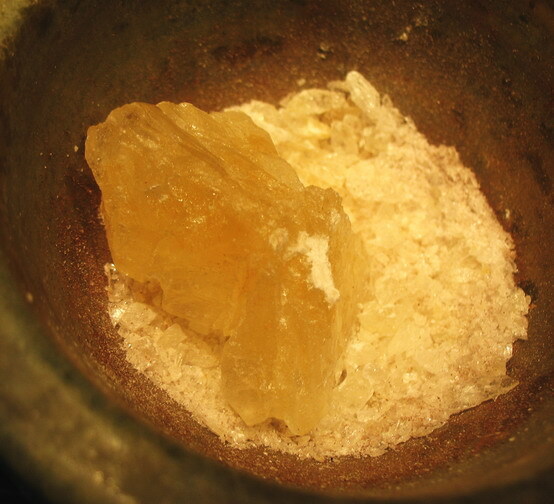 Rock sugar, which is not used in the Sichuan versions of the dish, is a necessary ingredient for the Cantonese version. Rock sugar, also known as lump sugar, yellow rock sugar or rock candy, is a crystallized mixture of refined and unrefined cane sugar and honey. It not only gives sweetness to red-cooked dishes, but also gives the sauce a unique glossiness and body which is difficult to replicate by using any other sort of sugar. Easily found in Asian markets, rock sugar is sold in plastic bags, and comes in medium to large glassy-looking yellow lumps. Many authors suggest putting lumps into a plastic bag and using a hammer to pulverize them into small chips; however, I just use my marble mortar and pestle to grind it. One good whack with the pestle reduces a lump to smaller lumps. Then, each smaller lump can be ground down into powdery shards separately with ease and no mess. 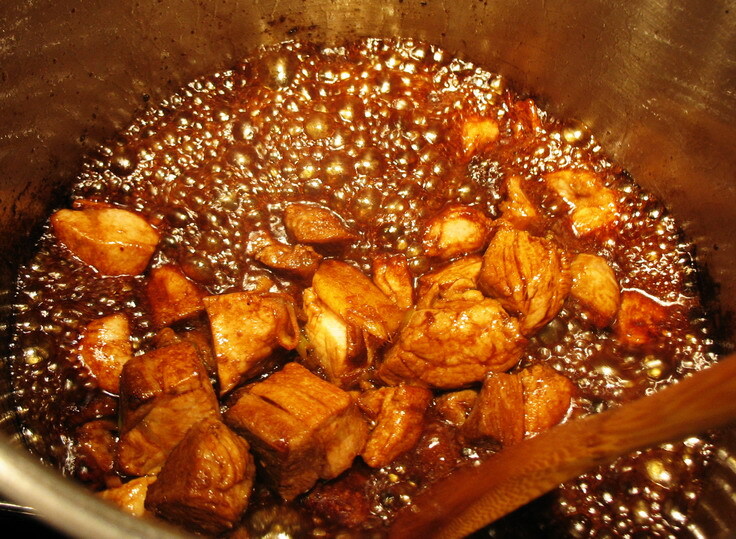 Good dark soy sauce is another essential ingredient to Cantonese red-cooking. (For a description of the differences between dark and light soy sauces, take a look at a former post on the subject here.) Get a premium brand like Pearl River Bridge or Kimlan; using Kikkoman will not give a good flavor to the dish, nor will it give the requisite reddish-brown tint to the sauce. 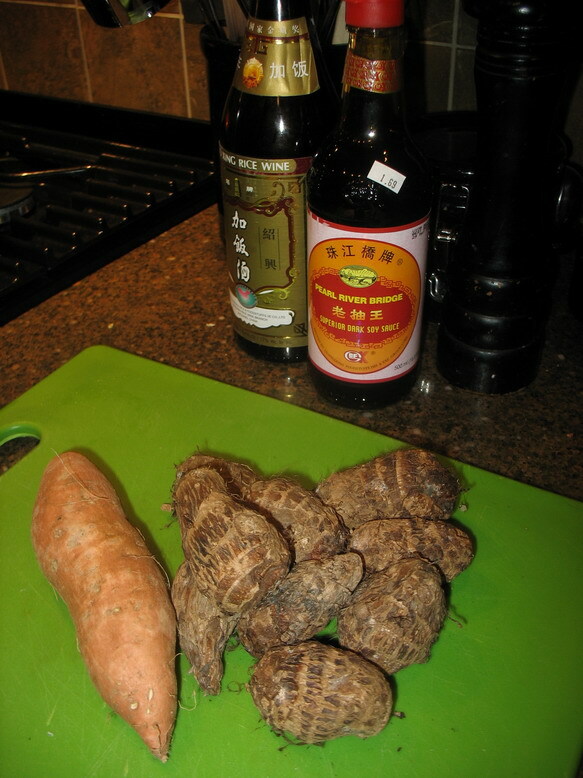 In adapting this recipe from Irene Kuo’s version in her classic cookbook, The Key to Chinese Cooking, I decided that instead of just using bamboo shoots in the stew, I would also add a favorite Pacific rim ingredient–taro roots. Taro roots are actually starchy rhizomes, and they are a staple ingredient in many southeast Asian and Pacific island cuisines. It grows in tropical climates, so it cannot be said to be local to Ohio, however, I am so fond of the texture of it and the way it picks up the flavors of what it is cooked with, that when I saw some at the Asian market here in town, I had to get them. Huy pointed out to me also that large raw taro roots are carved into elaborate decorations that look like ivory, but that one cannot eat raw taro for it is poisonous. In fact, even when peeling and cutting the roots up, one should wear gloves for the juice is irritating to the skin. The roots have to boiled for at least an hour (unless you are using a pressure cooker, in which case, ten minutes under 15 psi will suffice), in order to denature the crystals of calcium oxalate, which is one of the main irritating constituents in the rhizome. So–let it be known, that if you want to use taro root, you should wear gloves in peeling it, and you should also cook it thoroughly–at least forty-five minutes to an hour so that the rhizomes come to complete tenderness, lest you have severe irritation in your hands, your lips, tongue, and throat. If you do not want to play with taro and its irritants, or, if you cannot find it, then use new potatoes instead. It won’t be quite so authentically Chinese, but the stew will still taste delicious. As for the sweet potatoes and the leeks–well, they are not traditional. I used the leeks instead of scallions, and I used the sweet potatoes just because I knew that they would taste wonderful with the sauce. I don’t feel in the least bit bad about using untraditional ingredients, either, because, frankly, most Chinese Americans have been adapting Chinese recipe and techniques to western ingredients and kitchens ever since they have come to these shores–ever since the Gold Rush days. It is the way that diaspora cuisines develop, grow and diversify over the years. Heat oil in a Dutch oven over medium heat. Add pork cubes, ginger and leeks and allow meat to brown thoroughly. Deglaze with soy sauce and wine, scraping up any browned bits. 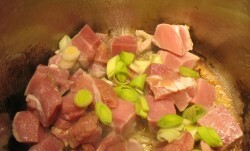 Add seasonings, bamboo shoots and boiling chicken stock or broth, and bring to a boil. Turn down heat so that the liquid simmers, cover and cook for about forty five minutes. Add taro roots and cook for another forty-five minutes, until meat and taro are fork tender. Add sweet potatoes and remove lid. 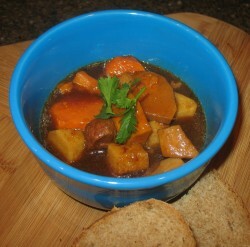 Simmer until sweet potatoes are fork tender. Bring liquid back to a boil, and reduce sauce until it thickens slightly. Add cornstarch mixture and allow to thicken. Season to taste with salt, and garnish with cilantro. That recipe is beautiful, and I’m planning to make it some chilly day. I love root vegetables! I also can’t beleive that you mentioned the China Garden in Huntington, I used to eat there all the time. This looks absolutely gorgeous. And, I love your East meets West/Bread meets Sauce idea. Thanks! I know I’m very late commenting on this, but I have to say that my entire family, including my notoriously picky brother, absolutely loved this, and told me to definitely save the recipe. And usually I’m the only one in my family who likes Chinese food, so that’s kind of a double bonus. BTW, pan frying the taro ahead to make both sides a bit crusty and a bit more fun to bite on. This looks yummy. Cant wait to try it.